J.D. King has premiered the official music video for Eloise, the second single from his upcoming full-length album, Moon Gardens, out later this year. Such a super smooth track guys! The Bossa Nova beat of the song creates a unique vibe that resonates with listeners and is perfectly complemented by its accompanying short film. Watch it below! I put the words in unconsciously and later realized it was about Linda. She’s like a respected queen, but I see her as an innocent doll-like girl. she would be perfect to put her special je ne sais quoi into each shot. 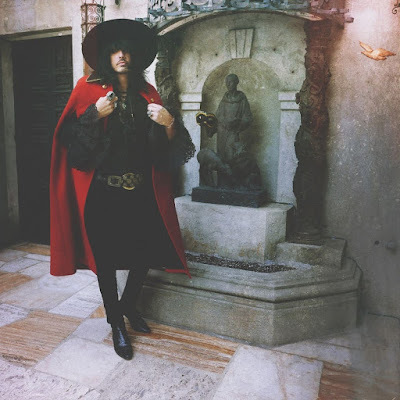 The music video shows a dichotomy of the character of Eloise, at first dressed in regal colors of red, gold and black with a mask on slyly walking around but once this mask is removed, the innocent girl is revealed and the tone of the video becomes more playful. Eloise follows his gorgeous single Midnight Rendezvous!